Tablet PCs could seem old fashioned to some. Why bother with a mixed ability device when you can have a tablet and a laptop as separate specialised units? Well, there's convenience - all your data on one device. Then there's price. The combined price of a good tablet and a good notebook would be more than the price of this Dell Latitude XT3 Tablet PC. Or at least, more than the starting price. Dell actually produces three versions of the Latitude XT3 Tablet PC. All have a starting price, though all can be augmented with extra features. So, the 'Base' model starts at £819 inc. VAT, the 'Essential' model at £1,119 inc. VAT and the 'Advanced' model at £1,349 inc. VAT. 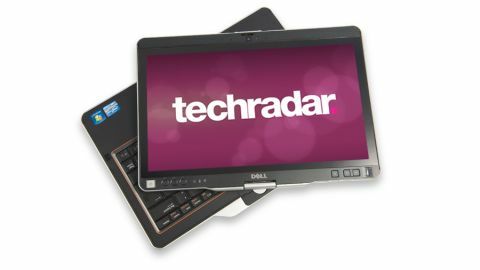 Whatever combo you go for, and the Advanced model has a Core i7 processor, 4GB RAM and a 128GB SSD as standard, the Dell Latitude XT3 Tablet PC is a chunky beast for a 13.3-inch laptop and we aren't sure it is a good advert for the convertible concept. The laptop weighs just over 2kg. That's quite a lot to hold in the crook of your arm for an extended period, even though Dell has rather cleverly engineered a 'bulge' on the back of the chassis that makes a very convenient finger-grip area. Then there's the battery life. The battery fits into the front of the chassis because the back edge is used for that grip we just mentioned. Dell says at its web site that the Latitude XT3 Tablet PC has all day battery capacity. But the 6-cell battery in our review sample didn't get near this. We were administering a power shot mid afternoon in everyday use. A 9-cell battery is an optional extra, but it's a slice that fits on the underside of the chassis and will add more overall weight. The screen is bright and sharp, though its viewing angles aren't great and that might mitigate against it in tablet mode. The 13.3-inch screen delivers a standard 1,366 x 768 pixels, and it is responsive to finger swipes and multitouch actions as well as to a stylus which sits in a housing on the chassis. The stylus could be easily lost - there's no lanyard to keep it attached to base if it falls from its housing. The keyboard is comfy, and we do like the adjustment system on one of the four cursor keys which lets you alter its backlight in increments or turn it off altogether. There's a pointing stick and a touchpad too. A fingerprint sensor assists with security, as does a SmartCard reader, and there's an ExpressCard slot as well as Firewire and VGA out included. All in all, the Dell Latitude XT3 Tablet PC is not a bad laptop. It's just rather chunky for a Tablet PC and the lack of optical drive and USB 3.0 combined with average battery life are drawbacks.